(Nanowerk News) Scientists are interested in using gels to deliver drugs because they can be molded into specific shapes and designed to release their payload over a specified time period. However, current versions aren’t always practical because must be implanted surgically. To help overcome that obstacle, MIT chemical engineers have designed a new type of self-healing hydrogel that could be injected through a syringe. Such gels, which can carry one or two drugs at a time, could be useful for treating cancer, macular degeneration, or heart disease, among other diseases, the researchers say. The new gel consists of a mesh network made of two components: nanoparticles made of polymers entwined within strands of another polymer, such as cellulose. “Now you have a gel that can change shape when you apply stress to it, and then, importantly, it can re-heal when you relax those forces. That allows you to squeeze it through a syringe or a needle and get it into the body without surgery,” says Mark Tibbitt, a postdoc at MIT’s Koch Institute for Integrative Cancer Research and one of the lead authors of a paper describing the gel in Nature Communications on Feb. 19. Koch Institute postdoc Eric Appel is also a lead author of the paper, and the paper’s senior author is Robert Langer, the David H. Koch Institute Professor at MIT. Other authors are postdoc Matthew Webber, undergraduate Bradley Mattix, and postdoc Omid Veiseh. Scientists have previously constructed hydrogels for biomedical uses by forming irreversible chemical linkages between polymers. These gels, used to make soft contact lenses, among other applications, are tough and sturdy, but once they are formed their shape cannot easily be altered. The MIT team set out to create a gel that could survive strong mechanical forces, known as shear forces, and then reform itself. Other researchers have created such gels by engineering proteins that self-assemble into hydrogels, but this approach requires complex biochemical processes. The MIT team wanted to design something simpler. The MIT approach relies on a combination of two readily available components. One is a type of nanoparticle formed of PEG-PLA copolymers, first developed in Langer’s lab decades ago and now commonly used to package and deliver drugs. 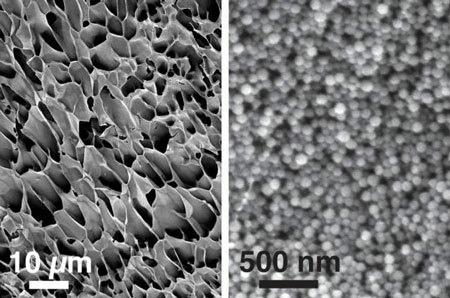 To form a hydrogel, the researchers mixed these particles with a polymer — in this case, cellulose. Each polymer chain forms weak bonds with many nanoparticles, producing a loosely woven lattice of polymers and nanoparticles. Because each attachment point is fairly weak, the bonds break apart under mechanical stress, such as when injected through a syringe. When the shear forces are over, the polymers and nanoparticles form new attachments with different partners, healing the gel. Using two components to form the gel also gives the researchers the opportunity to deliver two different drugs at the same time. PEG-PLA nanoparticles have an inner core that is ideally suited to carry hydrophobic small-molecule drugs, which include many chemotherapy drugs. Meanwhile, the polymers, which exist in a watery solution, can carry hydrophilic molecules such as proteins, including antibodies and growth factors. In this study, the researchers showed that the gels survived injection under the skin of mice and successfully released two drugs, one hydrophobic and one hydrophilic, over several days. This type of gel offers an important advantage over injecting a liquid solution of drug-delivery nanoparticles: While a solution will immediately disperse throughout the body, the gel stays in place after injection, allowing the drug to be targeted to a specific tissue. Furthermore, the properties of each gel component can be tuned so the drugs they carry are released at different rates, allowing them to be tailored for different uses. The researchers are now looking into using the gel to deliver anti-angiogenesis drugs to treat macular degeneration. Currently, patients receive these drugs, which cut off the growth of blood vessels that interfere with sight, as an injection into the eye once a month. The MIT team envisions that the new gel could be programmed to deliver these drugs over several months, reducing the frequency of injections. Another potential application for the gels is delivering drugs, such as growth factors, that could help repair damaged heart tissue after a heart attack. The researchers are also pursuing the possibility of using this gel to deliver cancer drugs to kill tumor cells that get left behind after surgery. In that case, the gel would be loaded with a chemical that lures cancer cells toward the gel, as well as a chemotherapy drug that would kill them. This could help eliminate the residual cancer cells that often form new tumors following surgery.